Well, not hunting. Owl Feeding is perhaps more appropriate. The summer of my junior year of college I worked for the Bureau of Land Management. One of my all time favorite jobs. I spent the summer hiking through the woods and rolling around in poison oak. It was a blast. 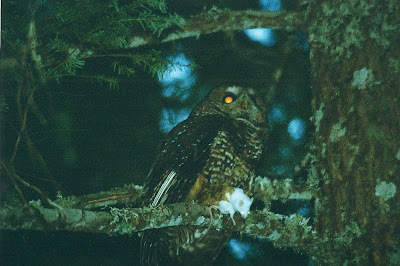 The Salem District of the BLM is home to a threatened population of spotted owls. 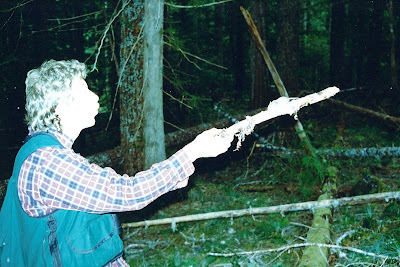 Interestingly enough, the biggest threat to the owls, besides logging, was the aggressive behavior of the closely related barred owl, a species that is better at adapting to fragmented ecosystems. Our goal was simple: Identify individual owls. 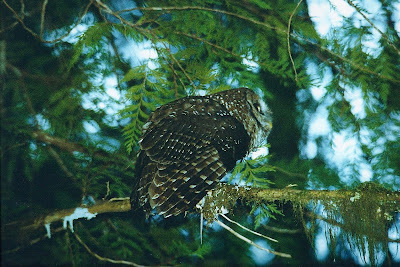 Most of the spotted owls in our area were tagged. The trick was to find a pair and determine which individuals were together (mated). Problem was, you couldn't see the bands unless the owls were about five feet away. Difficult if they're sitting 30 feet up a tree. At night. Solution: Mouse On A Stick. Instructions: Take one live mouse. Place on end of stick (see below, it's crawling down the stick). Owl will fly down, grab mouse. You will observe the leg band colors. 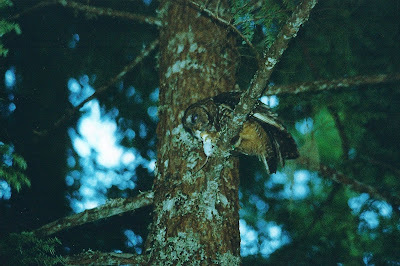 Owl bites head off of mouse and feeds to owlet. End of game. Or, if you're me, you repeat several times because it is just so darn amazing to watch. Sorry mice. 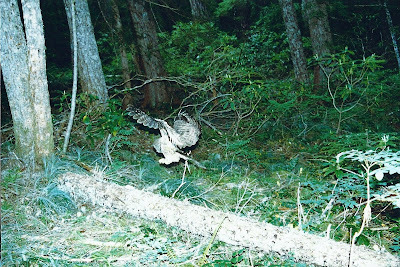 Who would have thought that a wild owl would have the courage to fly within a few feet of a very dangerous two-legged carnivore: But they do indeed and it is a sight to see. They are so bold that one even flew down and grabbed a wee mouse from my hand. Truly an amazing experience. Made up for all that poison oak.